Priorities: we all have them, but it’s difficult to determine which should come first. We all have 24 hours in our day. Yet, some people seem to accomplish so much more than others. For some, their accomplishment is at the expense of their families. Others recognize the importance of life-balance and accomplish much while ensuring that they do not forget the other important areas in their life. So how do those leaders complete this feat, while other people seem to wonder aimlessly through life? In flying to visit family for the holidays, airline passengers across the globe stuff their suitcases full of clothes and gifts to avoid paying extra baggage fees. Some travelers are experts at using every square inch of space inside of their luggage; they meticulously roll up each shirt and pair of pants prior to packing them. Other passengers do not have the knack for fitting their belongings within a single piece of luggage. Consequently, they’re forced to bring an extra bag on their journey. Our days are like identical suitcases. They’re all the same size, but some people can pack more into them then others. Your success in life depends a great deal upon how wisely you fill the hours in each day. Knowing your purpose, setting priorities, and developing efficient practices can help you make the most of your time. Clarity is the most important concept in personal productivity. To illuminate your purpose, ask yourself: “Why am I on this leadership team, on this payroll, on this staff, etc. ?” Ask and answer this question over and over again - weekly, monthly, and yearly. Surprisingly, most people are not sure exactly why they are on the team, payroll, staff, etc. They cannot give a compelling account of the value they add to the organization. Gaining clarity about the results you’ve been invited, volunteered or hired to accomplish allows you to perform at your best (and if it is a compensated role ... it qualifies you for pay raises, and puts you in line for promotion). Let your long-term perspective determine your short term priorities. Long-term perspective is more important than family background, education, race, intelligence, connections, or virtually any other single factor in determining your success in life and at work. This is the time a leader sets aside for thinking, reflecting, and strategic planning. As leaders, we have a bias for action; we want to make things happen. Since private time feels unproductive, we skip it. In consequence, our leadership suffers from a thought-deficit. Prioritizing private time replenishes our storehouse of creative ideas and clarifies our vision, better positioning us to lead well. a. What Are My Strengths? The percentage of time you spend at the intersection of your aptitudes (where you excel) and affinities (where you find enjoyment) will determine the level of success you experience. b. What Are My Opportunities? The best opportunities match your strengths. If your ability in an area does not put you in the top 10% of the population, then search for something else to do. People don’t pay for average. Also, realize that most opportunities don’t immediately bring results. Often, they only lead to additional opportunities. People who think that the first opportunity they encounter will take them to the top usually aren’t very successful. In fact, the first door of opportunity opens for everyone. It’s like the entrance to the supermarket—all you have to do is step on the mat and the doors slide open in front of you. However, the next door of opportunity requires some work on your part; you must turn the knob to open it. The door after that is locked and requires a key; you’ll need a gatekeeper to let you through. Each successive door of opportunity is more difficult to open than the one before. Those who go farthest in leadership are those who work the hardest to seek out and seize opportunities. While entire books could be written about how to prioritize time with people, let’s focus on the biggest time-eater on a leader’s schedule: meetings. Most meetings are not critically important, and the majority of them are useless. If you’re in a position of leadership, practice the following to avoid getting stuck in meetings. Don’t go alone. If you must attend a meeting, have a teammate accompany you who can take notes, identify action items, and carry the load of responsibility after the meeting. Don’t go to important meetings without having met unofficially with your top influencers beforehand. In truth, most decisions get made in informal settings and then merely made official at formal gatherings. Our time follows our priorities. Therefore, if our priorities are disordered we will mismanage our schedule. If you’re feeling crunched for time, don't focus on greater efficiency. Instead, re-evaluate your priorities. 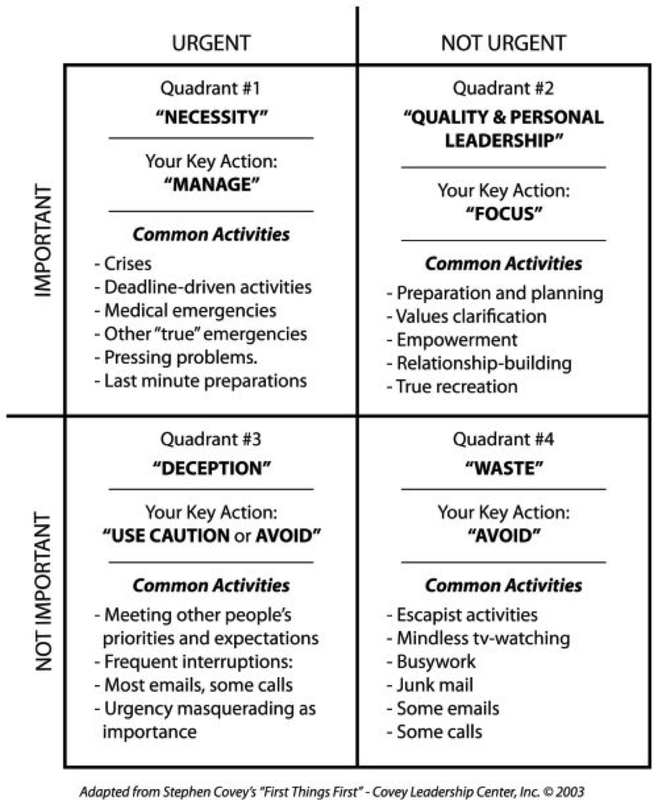 What guidelines do you use to measure your activity and determine your priorities? Consider implementing a "Rule of 5" ... a list of items to do EVERY day. 1. Write down your main goal. This will be your guiding light as you create your Rule of 5. Your Rule of 5 are the steps you must take in order to achieve your goal. a. Make a to-do list for your day. Include everything that must be done that day, as well as items you aim to complete over time. b. Write down a list of every thing you do to be successful. This can range from reading & writing to engaging with team members & building relationships. 3. Rank the items in order of priority. If various items are similar, you can categorize them to help with the prioritization process. 4. Highlight the top 20 percent of your priorities and make a memorable list of 5 things that allows you to allocate the majority of your time to those things. 5. 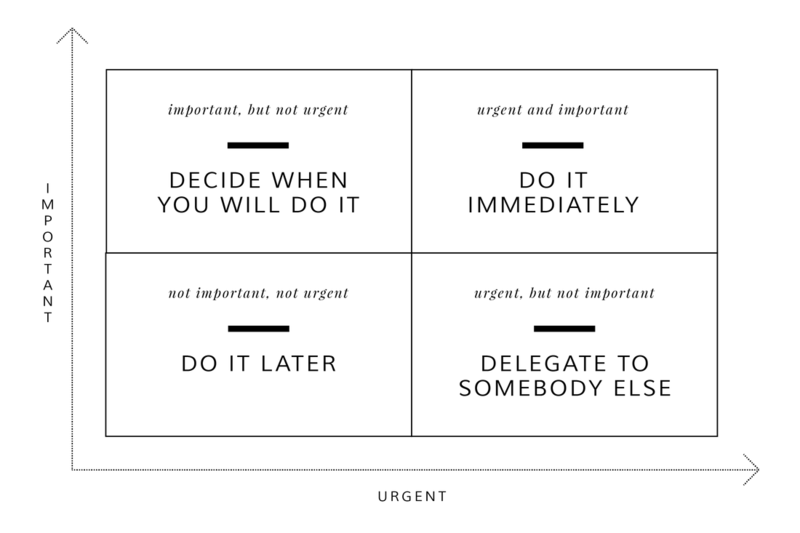 Print your "Rule of 5" and hang it where it is frequently seen. Repetition is key! If you are still having difficulty creating your Rule of 5, seek input from those who know you best and know your role. Sit down with another trusted leader and ask him or her to speak into your Rule of 5. Regardless, the key is that the items on your Rule of 5 must be done every day and have to be simple enough to achieve every 24 hours. There is never enough time to do everything, but there is always enough time to do the most important thing. In general, 20% of your activities generate 80% of your results, 20% of your customers account for 80% of your sales, 20% of your products services bring in 80% of your profits, and 20% of your tasks are responsible for 80% of the value of what you do. If you have a list of ten things to do, two of those activities are usually more important than all of the others combined. The same logic holds true for your relationships. Therefore, spend your greatest amount of time with the smallest amount of people. You’ll have more influence investing heavily into two or three people than in dividing your time equally among a dozen people on your team. Never begin the day until it is finished on "paper." Every minute spent in planning saves as many as ten minutes in execution. It takes only 10 to 12 minutes for you to plan your day. However, this small investment can prevent up to two hours (100 to 120 minutes) of wasted time and fruitless effort throughout the day. Don’t let your mouth overload your back. When you frequently overcommit; you routinely underperform. Using time efficiently necessitates choosing your involvements selectively and with extreme care. The most important work you do requires large chunks of unbroken time to complete. 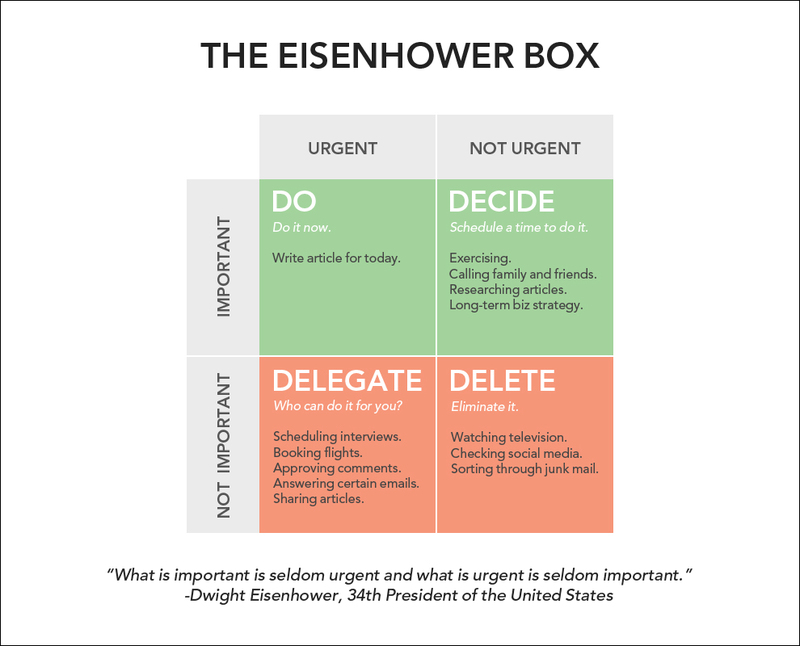 Your ability to carve out and use these blocks of high-value, highly productive time is central to your ability to make a significant contribution to your work and to your life. Be sure to schedule your day so that you have significant time free from distractions in which to take care of your biggest responsibilities. This addresses the areas of your life that are needed to fulfill your commitments and responsibilities. Maintaining one’s most important relationships comes to mind immediately. Far too many people push this area to the back burner as they pursue their definition of success, only to discover later that failing to maintain those important relationships results in relationships that are damaged beyond repair. Have you met people that achieved their definition of success then looked around only to discover their spouse and children are no where to be found? They quickly learned that achieving success was much more costly than ever imagined. All of the perceived benefits of success were minimized because of failing to consider the necessary rhythm required for a fulfilling life. 2. What gives the greatest return? 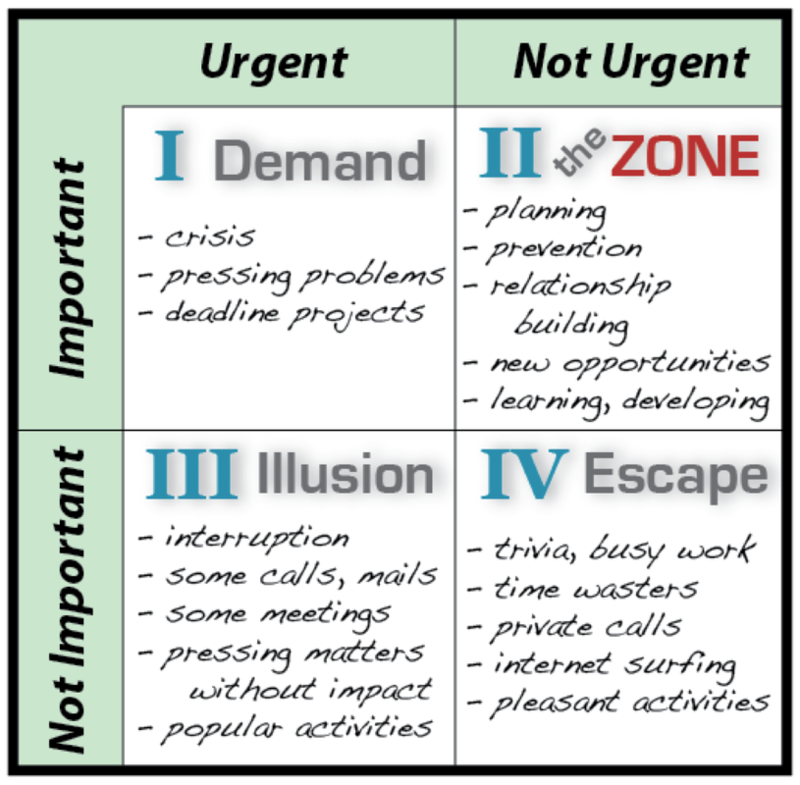 ​This focuses on identifying those priority areas with the greatest return. Leaders recognize that activity is not a one-to-one correlation with results. People that prioritize their efforts to align with high-value returns often recognize greater levels of success than those that get lured into low-value activity. The 80/20 rule comes into play when setting priorities. The 80/20 rule implies that completing the top 20% of the activity returns 80% of the value. Consciously evaluating priorities and applying effort to the high-value items leads to higher levels of success. 3. What brings the greatest reward? This focuses on areas that return a high-level of personal satisfaction. Keep in mind that maintaining a healthy rhythm is necessary during the planning of priorities. Items that return a high-level of personal satisfaction energize you to tackle tasks leading to other accomplishments. Everyone needs a time to recharge. This area of planning ensures that your plans incorporate time to recharge. Include whatever you find recharges you to face new challenges. An important step is to write down the outcomes when you plan your priorities because the urgent things in our daily lives tend to overwhelm what is truly important in life. Creating a regular routine for reviewing your priorities and setting goals that align with your priorities is a critical step to maximizing the 24 hours you have in your day. Resources: Adapted from The 21 Irrefutable Laws of Leadership: Follow Them and People Will Follow You and "The Maxwell Plan: Priorities" by John Maxwell; Watch a brief video on The Law of Priorities.